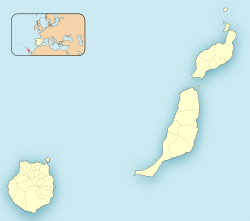 Artenara is a village and a Spanish municipality in the western part of the island of Gran Canaria in the Las Palmas province in the Canary Islands. The village of Artenara is situated in the mountains, 24 km (15 mi) south-west of Las Palmas. Its population is 1,198 (2013), and the area is 66.70 km2 (25.75 sq mi). Artenara is the smallest municipality of Gran Canaria in population.